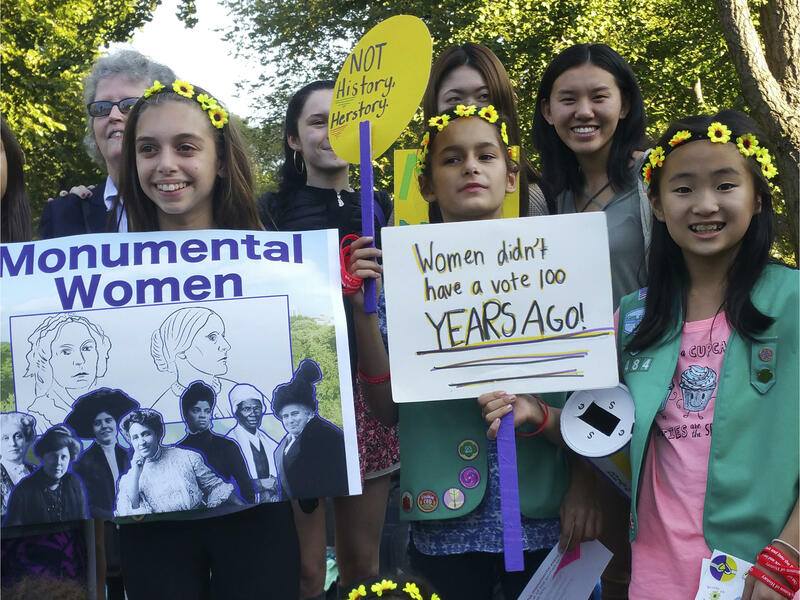 NEW YORK The Girl Scouts have joined an effort to break the bronze ceiling in Central Park, CBS New York reports. As WCBS 880’s Stephanie Colombini reported, the sculptures of historical figures that appear in Central Park all represent men. But Girl Scouts such as Phoebe Bergan, 10, with Troop 3484 in Manhattan, are trying to change that. “We just want to help other girls have an idol who they can look up to in Central Park,” Phoebe said. “We’re trying to crack the bronze ceiling,” deadpans Pamela Elam, who is spearheading the effort along with Stanton’s great-great-granddaughter, Coline Jenkins. The aim of the awareness and fundraising campaign - called Central Park, Where Are The Women? - is to erect the statue by 2020, the centennial of U.S. women’s right to vote. The effort has drawn the support of the Central Park Conservancy, a private nonprofit whose millions of dollars help beautify the urban oasis. Parks Commissioner Mitchell Silver also has given the green light to the suffragist monument, which is to rise by Central Park West at the 77th Street entrance. Phoebe’s troop teamed up with the Elizabeth Cady Stanton and Susan B. Anthony statue fund. They are raising money to put up a monument to the two suffragists in the park. “This will be a nationwide celebration, and New York City and Central Park will be the epicenter,” Jenkins said. It will cost about $500,000 in private donations to erect the bronze at the West 77th Street entrance to the park. About as much is needed to cover landscaping and an educational program. More than $150,000 has been raised so far. The 23 statues and busts honoring men in the park include representations of John Quincy Adams, Daniel Webster and even a famed foreigner, Giuseppe Mazzini, who helped create the modern Italian state.